I stayed with PHI, flying in the gulf, for about 1-1/2 years and I look back at that time with a smile. I have a lot of fond memories of the job and the people. Getting used to a 7-7 schedule took a little getting used to but, once you did, you found many advantages to it. As I remember it, crew change day was Wednesday and PHI change day was Thursday. When I was on GI47-AQ the other pilot and myself would load up the chopper with our stuff and fly it to the shore base just 22 miles away. Without even shutting down, we would swap out and the next crew would fly the ship back. My first 2 weeks on 47-AQ were quite an experience because the ship assigned to the platform was the 2nd oldest in the gulf with 14,000 hrs on her. If it were not for the other pilot, I don't think I would have made it. I don't remember his name but he was a happy-go-lucky young guy that had a deep southern accent, a fine wife, and two little girls that anyone would be proud of. The chopper that was assigned there was an old Bell 47J-2A. To give you an idea of just how long it had been around, that same model was the very first Presidential Helicopter. The pilot sat by himself up front and there were seats for 3 people behind him. Problem was though, the seats were there but the power to haul that many people was not. I could barely fly it with one passenger and minimal fuel while the other pilot was flying it with 2 and on rare occasions 3 passengers. The other pilot made excuses for me to the field boss and said I just needed more time. In the second hitch he took me out and showed me how to fly a severely under powered bird like that. He showed me that with one passenger you could hover normally and make a normal takeoff. With 2 passengers it would hover at about 1 ft, not enough height to clear the safety fence around the heliports. Catch a float and you were dead. But the ship wanted to fly and get it airborne and at about 20 ft out it was flying. How to get it out there was the question I was having a problem with. The trick was to get to the very edge of the platform, then get her light and start rolling on an over-rev with the throttle. Just as she started to go over engine redline, pull in pitch, which would jump her up 3-5 ft, then nose her over. I added a little prayer for safety sake. By the time the blades figured out there was no power behind them and started to bleed down, you were already past the edge of the platform and had nosed her over and she was flying. Come off pitch a little and the rpm came back. Like I said, the lady wanted to fly. Landings were no problem at all because it held it's ground cushion well with those floats. After I was shown the technique of flying such an under powered machine, it was a piece of cake. My hat still goes off to that pilot for sharing that with me. It was hard getting non-essential parts for that old gal so I had to do the best I could. The throttle was so worn that almost all the cork was gone and there was just bare medal there. That made it rough working the throttle with a sweaty hand so I shopped around and found the perfect small diameter rope to wrap around it. I then put a layer of adhesive around the medal and wrapped the throttle with the rope just as you would splice the end of a rope. When the glue set over night I had my replacement throttle. Just as I was really getting comfortable with the ship they pulled it in to headquarters for a special inspection and gave us a regular 47-G model. It was nice to have all that power but there was something sort of mystique and honorable about flying that old girl. Then I heard the news. Maintenance had found and wrote up 214 gigs on her and had grounded her permanently. That number still sticks with me today, The 47-G4A was now our permanent ship. Funny thing though, they didn't call me in for firing or say a thing. When the hitch was over I went to headquarters to find out what was up. I had maintained that ship the best I could with what I had and she was a very safe flyable machine. I was ready for a battle. Didn't need to though, they just gave me the gig report and let me see for myself. The new rope throttle was written up as un-authorized, which was kind of right but what was I to do? Everything else was oil leak here, grease smear there, paint chip here and so-on. All you could do with the engine leaks was wipe them down often. What had taken place was an inspection to authorize the retirement of that chopper, it had become too costly to keep parts for her. And so nothing was ever said and I returned to my job and started flying the newer bird. There was one close one with that old girl though. I had been sitting on an outlying rig waiting on a guy when he finally came up to go. I checked the wind and waves like you do for all takeoffs and landings, which had to be into the wind. My passenger got in and I cranked her over then hopped over to the edge of the platform. At the same instant I popped her up and over the edge, the wind changed and she fell like a rock instead of flying. I knew it instantly and without altitude, that I was losing extremely fast, the only thing left was airspeed. I nosed her over and dove her for the water. I guess it was about 10-20 ft from the surface when I pulled her back and, though shaking a bit, she began flying. That was my only close one for my time in the gulf. One thing that is for sure in the gulf, the people there do eat well. It was my job to fly out some of the lunches for the guys working on the other platforms in the field but there was this one platform that had 3-4 guys on it and they didn't want their lunches. I finally got the chance to stop by for a while and I found out why. In their little air-conditioned office was a mini kitchen that they had set up. On the stove, simmering and filling the whole place with an aroma that would win a blue ribbon for just the smell alone was a duck gumbo. They gave me a bowl and it became obvious why they fed themselves for lunch. On shift change each would bring a cooler filled with the necessities for the week. I envied them in their little paradise. After a couple of weeks of flying the guys around and convincing them I wasn't going to wreck them, I started making friends. There was one guy in particular that I had to fly around a lot because he took gauge readings from most of the platforms on a daily basis. He would always mimic my control movements like he was doing the flying from his side of the ship. On my next break, I picked up a little kiddy steering wheel from an infants store and, just before he was to get in for his lift, I taped it to the bottom and front of his seat. As he saw it getting in, a smile came to his face and he instantly pushed the horn in the middle of the little 6" steering wheel. He flew right along with me that day and I made a friend. When he got back on with some of his friends they asked what that was and he said that today he would be flying them around. About my 3rd hitch there a serious choice had to be made among the rig workers concerning the cook's helper and me. We both were new guys and someone had to be initiated. The cook's helper was chosen because proper chopper transportation was crucial and they decided it best not to make me mad, besides, I was playing boo-ray now and they liked my money and didn't want to make me mad enough to guit playing. They set it up well and my hat goes off to them for it. We were all in the TV room watching the end of the evening news when the boss comes in the door in an apparent argument with the #2 boss. The boss said something to the effect that he could and #2 said he couldn't. Now you don't hush the boss so we all just listened. The boss again said yes he could and that the #2 man could even pick the 3 guys. Pick 3 guys for what, I thought. Then the boss said he'd bet $100 that he could pick up any 3 men, of #2's choosing, and hold them there for a full minute. #2 took him on and picked 2 of his larger buddies and then told the boss he would go easy on him and pick the cook's helper as the 3rd man. The cook's helper, wanting desperately to be recognized as one of the guys, accepted the challenge. The boss then told all 3 men to lay on the floor with the cook's helper in the middle spread eagle. He then explained how he was going to intertwine all three and thus pick them all up at one time. With the cook's helper's arms and legs securely entwined with those of the men on either side they were ready. The boss made his way between the men flexing his back and arms for the big lift then bent over and started undoing the cook's helper's belt. Didn't take him long to figure out something was up and he wanted out of there. Didn't budge more than a few inches though because those 2 guys had him good. His pants came down as well as his underwear and someone came in with a lard can and greased his private area good. Damn if he wasn't mad when they finally let him up. I'm sure glad they picked him instead of me. There was compassion there though. One of the older guys came over to him and explained to him that he was now one of the guys and that he was respected as such. They would not have done it if they hadn't liked him. That cheered him up as well as all the pats on the back he got from the guys afterwards. One thing that I could not understand about life on those rigs is why so few of the men fished. There were all kinds of fish to be had. I love fishing and I was in 7th Heaven there off shore, evenings wise, when I had finished my maintenance. Come evening, you wanted the pilot, you had to go downstairs to the boat area. There was a mess of fish under that Rig and 60 ft of water or not, I was going to get my share. With a small donation of shrimp from the cook's freezer (Fridays was seafood night), one had one's starter bait. You catch the first fish then cut him up for bait for the others. There were 2 problems thought, trigger fish and giant, very huge, fish. Trigger fish are nasty looking things that stayed near the surface and would steal your bait before it could get to the bottom where all the good fish are. You had to use a real heavy weight to get past them. Hard tails were the basic food fish for the big fish and they swam by the thousands in schools around the platforms. The larger game fish were 1/2 way down and the sharks were on the bottom. I must have fished for my first big shark for months before the boss saw me fishing on the surface for them and told me I was doing it wrong. Sharks, it seems, stay away from the surface during the day, unless they are huge, because if the porpoise catch them on top they will play with them and not let them down. So I sent my bait to the bottom and had my first 6 footer in about 20 minutes. After that I guess I caught between 40-60 sharks in all . My largest shark was a 16 ft White and I caught him on a hand line. My hand line though was a 150 ft long boat rope with 12 ft of tail rotor cable and a foot long hook. You put a hard tail on with his tail cut up a bit for blood then you toss it in and the weights will take it to the sharks below. You then wrap the coil of rope one time around the side rail of the platform, putting a small loop in it to signal you when the line is going out, then tie the end off to the other side and wait. With that done you just continue fishing pole fishing for the game fish. After about 1/2 hour I noticed the small loop gone in the shark line so I pulled in the pole and went over for a look-see. The line was going out slow so I figured I had another small one. I let it go out about 20 more feet than set the hook. He fought for about 2 minutes then it was just like pulling up a 100-lb bag of rocks, hard and slow. The guys on the catwalk above could see straight down better than I could and they began shouting about the big one I had. I pulled some more and finally saw that I had a huge shark that apparently was playing dead on me. I got him right to the surface and tied him off so that he was about 20 ft directly below me. Since each grate on my catwalk is 8 ft long he measured out 16 ft. As I was gloating over my victory a large ground swell came through from behind which brought the water level up to about 2 inches above the catwalk. My feet got soaked and now I was looking at this huge shark now just 3 feet away. The wave went by and he slid down the backside of the wave, which put him over one of the main connecting beams of the platform which left him partially hanging in mid-air. The line broke and my shark slowly sank, inverted, down through the center of the platform. I didn't even have time to run up for the camera. King Mackerel amazed me. It seems the adults mate for life and are widely traveled. King Mackerel are a torpedo like fish that are about 4-5 ft long and very skinny. Two had chosen our platform to forge around and they would really put on a show. Coming up from deep water they would attack the school of hard tails together with the first zeroing out a specific fish and going for it. I don't know how that specific fish was chosen but it knew and as the rest of the school would high-tail it under the platform for protection that one chosen fish would make for the surface and jump out of the water a good 6 feet or so. The first King Mackerel would follow it right out of the water but it's faster speed would propel it past the airborne hard tail. 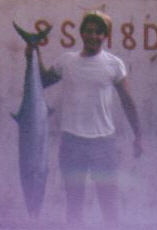 The second King Mackerel though would make a short leap and catch the hard tail in mid-air. What a sight. I didn't realize fish had that level of intelligence and I did not know they mated for life. My biggest fish, on a pole, was a 14 ft or so Hammerhead. He got away too. I was fishing off of the production side of the platform. It was a hot August night and the ocean was as still like a mirror. I was trying to hear what was being said on the beach some 22 miles north. Yes, sound does travel that far and some of the voices can be heard. I had a hard tail on 80 lb test line and gave it just enough line so that it was splashing on the surface below me some 80 feet. I heard a little splash bigger than the hard tail could make and looked down. Ready to bite was a huge hammerhead about 14 ft long. I gave the pole a good yank hoping to bring the fish up and save my gear. The shark's head came about 3 ft out of the water to get it and down he went. I held on and in less than 10 seconds the line was shredded from contact with it's skin. Wish I could have turned him. I was pretty popular with the housewives back at the apartment complex that I stayed at. I had a lot of friends there and when I got home I always passed out most of the fish that I had caught, cleaned, and frozen. There was a little problem though. I would catch them, clean them, mark the packages as to what kind it was and freeze them. Come break day though some of it came up missing and it kept getting worse. I found out that some of the guys were taking the packages home to give to their wives. I cured that quick. I told the guys I wasn't going to save anymore fish. I still fished and cleaned them but, when I packaged them, I labeled them all "Liver". I had a little code and if I had a little "l" it was one kind of fish, if it was underlined it was another kind and so on. The code worked and I went home to the neighbor ladies with a cooler of fish. Unless a platform inadvertently shut down, the workday ended at supper time. For chopper flights, it was usually supper time or 45 minutes (if I remember correctly) before sunset. That was to give a rescue boat time to get to you if you had to put one in the water. In the summertime, the water is usually on the calm side but, in the winter time, it is really rough out there. Many times the fishing boats would tie up to the quarters' platforms for safety sake during particularly bad weather. I've heard that cooks would sometimes go down and charge the captain a bucket of shrimp or some red snapper (snapper boat in the picture) for that right, which was a heck of a bargain for them. I can remember one spell when it was really bad and we couldn't even fly, even the boats were not going out. It was very late at night and one of the boats was trying to tie up for safety and they hit the platform really hard. It woke everyone up and shook the whole place and, for a split second, everyone's mind was on the platform rolling over. I had it good in the gulf. The 7/7 schedule was working out fine for me and I had a lot of friends. I was starting to enjoy the southern lifestyle, but I was restless inside. After 1-1/2 years I left there, to return to the northeast and be closer to home. If I found myself back down there in these later years of my life I believe I could settle in quite nicely. On to New York City.